Hey guys, I'm back. I missed Love 'Em Leave 'Em last week, but hopefully you saw my Instagram (@fantasyfootball.gods) because I posted a lot more on there last week, including QB and RB Love 'Em Leave 'Em. I swung and missed with Russell Wilson (love), but my #1 leave was Ben Roethlisberger who threw 5 interceptions for the first time in his career. Also, make sure you follow my Twitter (@_FantasyGods_. Without further ado, let's get into Week 6 Love 'Em Leave 'Em! Love 'Em - Deshaun Watson vs. CLE - In case you weren't aware, Deshaun Watson is on fire right now. He has 10 TD's in his last two games. He's had one of the best starts from a rookie quarterback in recent memory. This week the Texans play the Cleveland Browns, who've given up the 4th most fantasy points to quarterbacks. They've played Ben Roethlisberger, Joe Flacco, Jacoby Brissett, Andy Dalton, and Josh McCown this year. It's early, but it's not far fetched to say Deshaun is the toughest quarterback they've faced all year. Also, game flow will not be an issue considering he had over 40 fantasy points in a 57-14 rout against the Tennessee Titans. It's a short list of people above Watson this week. Leave 'Em - Jared Goff @ JAC - Here we go referring to Big Ben again. Did you see Sacksonville's defense last week? Pummeled the future hall of famer Big Ben, forcing 5 turnovers. This week the up-and-comer Jared Goff gets them. He's been great this season but has had the chance to capitalize against mostly bottom-feeder defenses. He struggled last week against Seattle, throwing 0 touchdowns and 2 interceptions. The Rams and Jaguars are pretty evenly matched, and we know Jacksonville wants to run the football, so expect Los Angeles to do a lot of the same. Love 'Em - Alvin Kamara vs. DET - With Adrian Peterson out the door, it's Alvin Kamara and Mark Ingram's time in New Orleans. Kamara was already having a successful season, currently a PPR RB2. They get their first game in an open backfield against Detroit. The Lions allow teams to throw to running backs 1 out of every 4 times, approximately (via @LordReebs on Twitter). If it's anything like the past couple years, there's going to be plenty of scoring involved. I think Kamara deserves top-15 recognition this week in PPR, at least. Leave 'Em - Frank Gore @ TEN - All good things must come to an end. I referenced this in my waiver wire article; Marlon Mack is taking over fast. He's the far superior option to Frank Gore, as has been evident all season. Chuck Pagano was recently in the news saying Mack wasn't ready for a big role, but then again, Chuck Pagano isn't really ready for a big role in the coaching department. Gore simply doesn't possess the upside to be started this week. Love 'Em - DeSean Jackson @ ARI - D-Jax is due. Winston and Jackson attempted to connect deep constantly tried to get the deep ball going last TNF, with Jackson eventually having over 100 yards. They've had 10 days to build chemistry and will show it tomorrow. Arizona has been EXTREMELY susceptible to the deep ball this year. Remember Brice Butler in week 3? What about Nelson Agholor last week? D-Jax is going to provide you with that week-winning play, book it. Leave 'Em - Jarvis Landry @ ATL - Don't be fooled by the production. Jarvis Landry is struggling. It's entirely Jay Cutler's fault though, but that doesn't matter in redraft because Tannehill is gone all year. He caught a touchdown last week, which cannot be counted on. The previous two weeks, most of his work was done in garbage time, which also cannot be counted on. Devante Parker might be out, but Parker and Landry are two polar opposite receivers, which means it doesn't really affect Landry. Atlanta has a very underrated secondary, and I really would not want to start Landry in standard leagues. 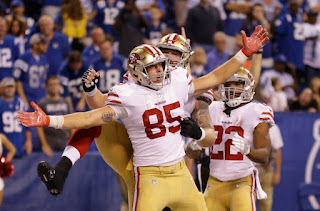 Love 'Em - George Kittle vs WAS - It's a bye week, and that means a good bit of teams are looking to pick up a tight end off of the waiver wire. Look no further than George Kittle. Owned in only 7% of Yahoo! leagues, Kittle recently went over 80 receiving yards for a touchdown. He faces a Washington Redskins defense that's one of the worst defenses in the league against tight ends. ASJ was the stream of the week last week, and he did well. Let's hope Kittle can repeat. Leave 'Em - Kyle Rudolph vs GB - Kyle Rudolph has not exactly had the start to the year we envisioned him having as everybody drafted him as a top-12 choice. He's gone over 10 PPR points just twice all year, and has noticeably struggled when Case Keenum is leading the Vikes. Keemun is playing again tomorrow, and GB has allowed the 2nd fewest points to TE's all year. Stay away!